The note to Miss Bonner asks her to acknowledge the note about a letter that has gone missing. A donation of $150 is recorded at the top with a note that Mr. Hammond read an article in the Highlander. 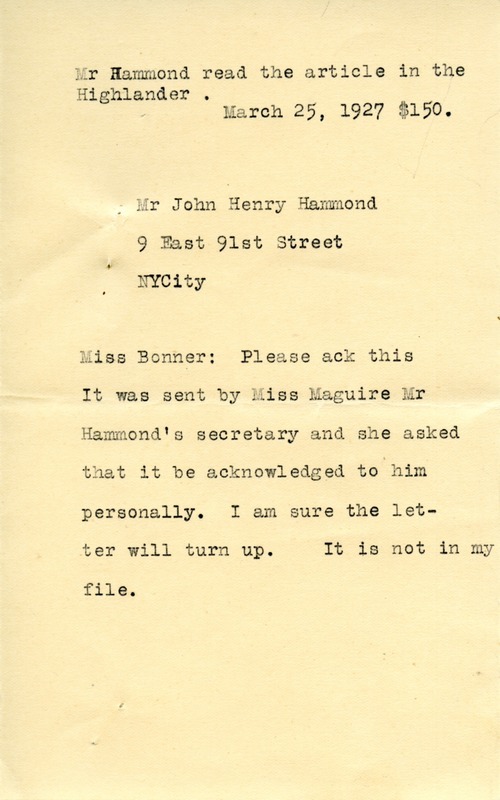 Mr. John Henry Hammond, “Letter to Miss Bonner from Mr. John Henry Hammond.” Martha Berry Digital Archive. Eds. Schlitz, Stephanie A., Cassie LaJeunesse, Savannah Harris, et al. Mount Berry: Berry College, 2012. accessed April 24, 2019, https://mbda.berry.edu/items/show/4086.